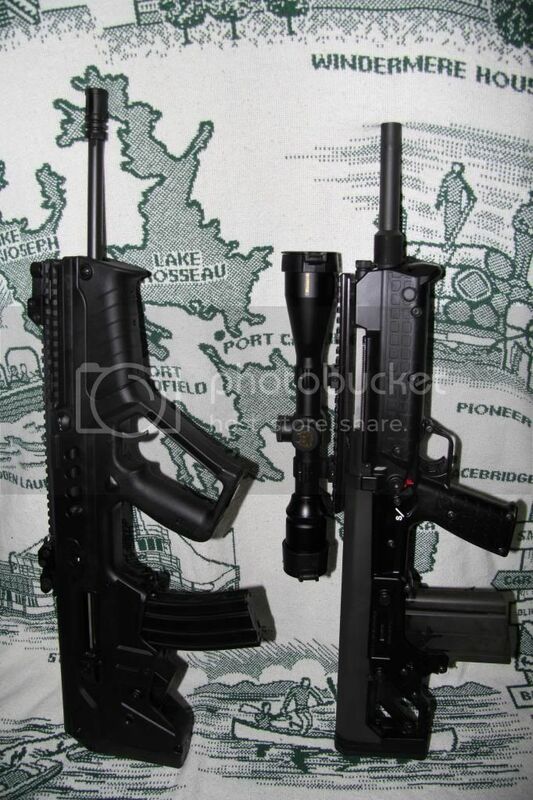 The IWI version of the X95 came with the 13 inch barrel and we had to take the 16.5 inch version. I know IWI had said they will, at some point import the 13 inch version but that could be a long way off. My question is. As far as velocity/accuaracy how much do you lose with the SBR version? At what range would it start to suffer? My left brain tells me to SBR my X95 but my right brain say's leave it as is. Ballistic information or hands on range time experience would be greatly appreciated. Even Israel have gone to a 16" barrel on the latest version of the X95. This is discussed extensively all over the internet. Suggest googling barrel length effect on 5.56. Wanting and needing are 2 different worlds- needing a shorter barrel on the Tavor bullpup is ridiculous, and is actually a step backward, and more negatives than positive. Have they? or is it the standard issued rifle for infantry raw recruits? I think a 13 inch barrel would serve better on a ship that had been hijacked for example where running through tight bulkheads and being in tight confined spaces could be an advantage so I think the 13 will still be used depending on the mission by special forces. Evaluating is the stage i'm in now. weighing it all out so it's going to be a slow process. Your information as a step backward is good to know and I can dial in on why that is as I look into this further. All new X95s issued in the IDF will have a 16" barrel. It is the standard weapon of the IDF. The 13" barrel only serves to make the gun more maneuverable in tight spaces. As it's a bullpup, that's really not necessary. The standard issue M4 comes with a 14" barrel and is effective to 500 meters. But it's really about barrel quality more than length. Does length help or make any difference when talking about accuracy? The answer is yes and no. Out to 200 yards, the difference in accuracy is negligible. For a tool like the X95, 200 yards is really the longest I'll be taking shots. I have hit targets at 800 yards with this gun, but that's just goofing around. At those distances I'll pick a real long range gun and caliber; this ain't it. So, if you want a 13" barrel and are willing to go through the SBR hassles, go for it. It won't make your accuracy worse for 99% of your shooting. However, the 16.5" barrel has been great for me and I have no intentions of changing anything at this point. I've contemplated SBRing my X95. The 13" barrel would be nice as i almost always run a suppressor, so it would make up for the extra length. The other hand, having a 16/18 barrel and good performance out of the 5.56 as well as better suppressor performance is nice. Also no restrictions if I travel out of state. When I think about SBRing my X95 I just look at my SBR PS90;not the same performance, but is very compact and handy...so the X95 makes less sense to dump money into to make it SBR. Now If I had a 9mm or 300 blk, I would be a lot more inclined to SBR it, as those rounds won't have huge degradation going to 13 or shorter barrel. I have a SBR stamp in for my 9mm X95, because i want to return it to its standard configuration, even if the new ones are 16” they have the flat buttplate so you’d need to pin and weld or SBR just to use that. Alls I know is I'm still waiting on the X95 SBR that's in the 2018 catalog. Was supposed to be 1Q 2018. We're in 3Q. After posting a fleeting thought for a thread and looking into it a little more I think I'm going to stand fast. Correct me if I'm wrong but the 5.56 was designed for a 20 inch barrel for maximum efficiency. The 16.5" barrel degrades this somewhat but not near the point of critical. 14.5 seems to be from what I understand to be that line in the sand. At 13 you really have taken a step backwards. So If I were going to do this 14.5 would be my choice. However to go through FFA paperwork and fees and a gunsmith to cut and crown for 2 inches doesn't resonate with me. Compact yet efficient is what I would prefer and that's just how the gun came as designed. I definitely agree with this^^^^. It's a bullpup. You get a bullpup for a longer, more efficient barrel length in a shorter package. That's already achieved in the SAR and X95. I reload, and I can tell you that 16" and 20" barrels in 5.56 are more than ballistically efficient to give the nod to the 16" for a combat style all-around rifle. I have AR15's in lengths all the way from 10.5" to 24" at every prime length between. Limited to grabbing "the one" and only rifle in the safe to go-to-war with, it would be the 16" AR15...add here the SHTF and zombie apocalypse scenarios...LOL! Now, when it comes to owning, modding, building, or gunsmithing any gun that exists to the actual need or just plain old desire to any length whatsoever, well, that's up to wallet and personal pursuit of the owner. I understand shorter-than-16 AR15's as an almost normal pursuit being the gun is already decently long. But it when it comes to bullpups, you just don't pay much of a price for a 16" barrel. Jean Cantius Garand was a Canadian designer of firearms best known for creating the first successful semi-automatic rifle to be widely used in active military service, the M1 Garand. And the Micro Tavor has a 13.5” barrel..you cant physically go shorter than15” on the CTAR without cutting up the body of the gun. One reason they designed the X95 was to be able to use a shorter barrel. Rather than worrying about accuracy with the short barrel you should look at the TERMINAL EFFECTS of your projectile (Bullet) on the target. The shorter barrel looses so much velocity that it effects the projectile effect on the target. Go and read the ballistic reports on projectile effects on targets from different barrel lengths. Even reducing the M4 barrel to 14.5 inches reduced the distance for the terminal effects on the target compared to the 16 and 20 inch 5.56 barrels. Now they claim the "effective" ballistic effects using ball ammo in an M4 (14.5 inch barrel) is something like 45-75 meters vs. a somewhat increased range with the longer barrels. Do you remember the complaints that when shooting the bad guys, the projectiles just went through their body with no effect. If IIRC correctly they claimed the effect on the bad guys in Africa, it was like hitting them with a knitting needle, just going straight through with out any effect. So their solution was to change the projectile to increase terminal effects with the decreased velocity. Just throwing some information into the mix, something else to look at when you are deciding what is important for your life. I just got back from the OIR theater and was there for the switch from M855 to M855A1, which, from the info given us, was to provide better penetration and better tumbling effects when used out of shorter barrels since the trend now is towards more and more 10.5” mk18s being fielded and almost no in-use guns with longer than 14.5” barrels across all branches. No M856A1 yet, so everyone was just rolling around with every 4th round being standard M856 and having a different POI than the A1s, but whatever . This all to reiterate your point that the military’s solution to the short barrel velocity issue is projectile choice. I know there’s been fantastic terminal performance from commonly available things like 77gr OTM rounds at shockingly low velocities, so I see no reason why maximizing the handiness of the x95 by using a 13” barrel wouldn’t be a fine idea when using appropriate rounds. If it’s fine for the 10.5” mk18s, it should be even better for a 13” x95 sbr. I read where the reason the IDF was going back to the 16" barrel was because IDF troops had a tendency to shoot obstacles like door jams, window ledges and similar barriers or concealment. 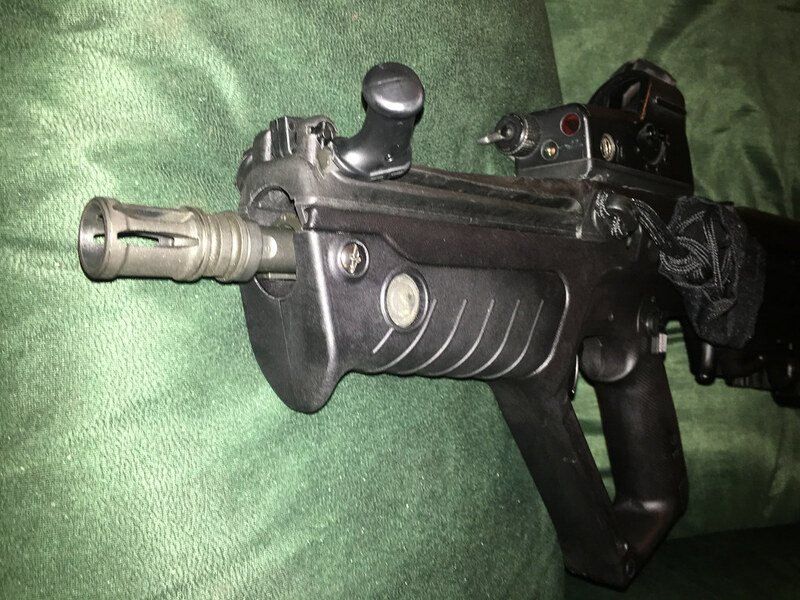 With the X95 with the 13" barrel it is not as easy to preceive whether your muzzle has cleared obstacles when conducting operations in built up areas/buildings ect.. Several IDF soilders had been injured from projectiles and blast hitting objects in close proximity of the muzzle/shooter. The added velocity was also seen as a benefit. Granted the height over bore is a training issue but some times in the heat of the moment soilders were not getting sufficient muzzle clearance in combat situations. The barrier thing makes sense, I've had similar issues in training classes with shooting around barricades when every conventionally laid out rifle can simply lay their barrel against/beyond the barricade. A good reason to want to shorten down to 13" would be using a suppressor; a short, fat can and a flat buttpad on a 13" X95 should be about the same length as a stock US x95 and balance similarly. Unsuppressed, I think you'd need to predict a lot of vehicle or tight-space work in your future to want the x95 to be much shorter. I think the 13" barrel with a suppressor is the ideal setup for the 5.56 X95 in CQB. Although the 16" barrel length provides better ballistics, I too heard that the main reason the IDF switched was because of soldiers shooting doors, etc. with the shorter barrel. But having a suppressor makes up that length while giving the obvious benefit of sound reduction. The loss in ballistics can be improved with the right kind of projectile, as Amoresttelum pointed out. That being said, I personally will never run a suppressed 13" X95 as I am not interested in registering anything with the Federal government under the unconstitutional NFA. If you're willing to have your name on the list of people first to have their firearms confiscated when the socialists/communists totally seize control, be my guest. For 3" less barrel and 20db noise reduction, I'll save my $400, wear ear plugs and just keep my X95 as it is. "But you registered anyway when you filled out the 4473." Yeah yeah. Humbug. I still won't do it.